disclosure: This post is sponsored by my friends at DOLE, but all opinions are my own. Halloween recipes are my favorite in terms of presentation creativity. I love all the spiderweb, ghost, goblin, vampire, monster, witchy fun that food bloggers spook up and into their recipes this time of year. Tricks and treats are to be expected. 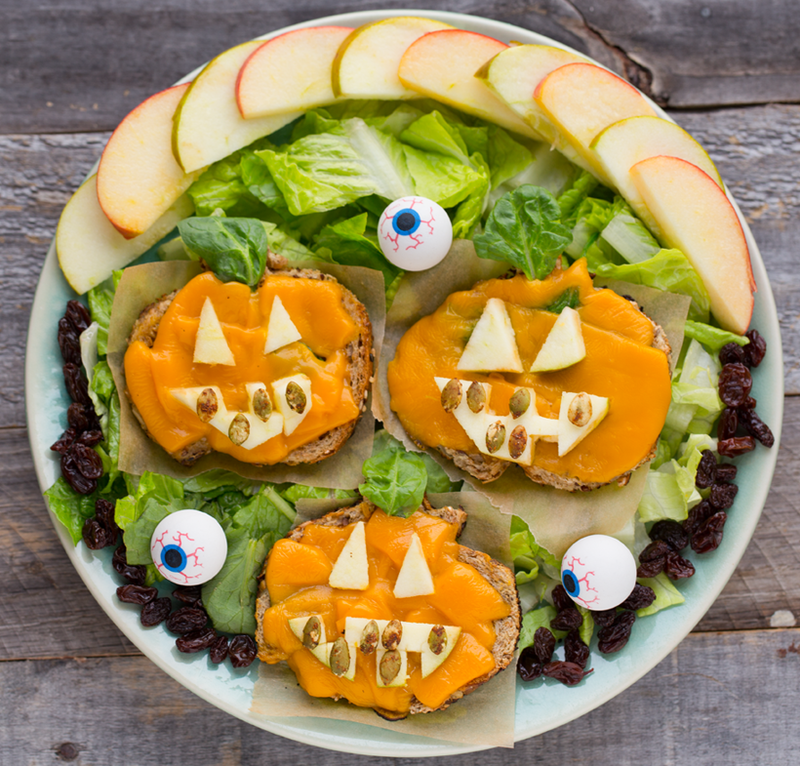 But Halloween doesn't have to celebrated with just gobs of sugar-loaded goodies and candy candy candy - things can get delicious, spooky and festive using healthy fruits and veggies! That is why I am so excited to be throwing a Healthy Halloween Pinterest Board Takeover with my friends at DOLE. 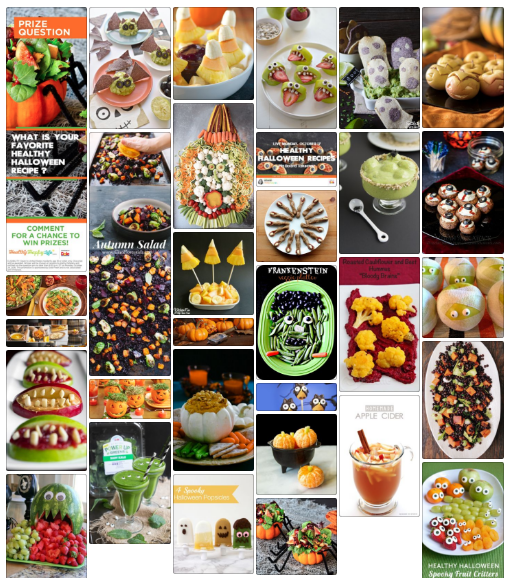 Starting today, I am going to be pinning loads of vegan, fruit and veggie-loaded healthy Halloween recipes over on this board. And besides all the spooky-fun recipe ideas, there are prizes! 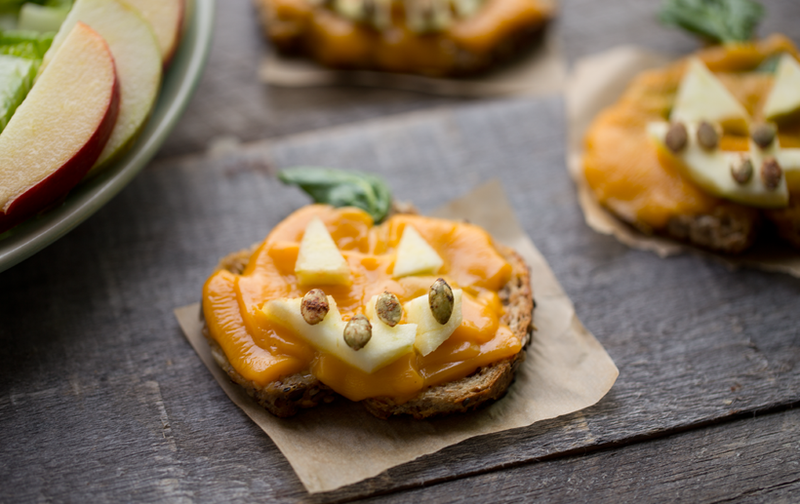 All the details on the Pin board contest, plus my two Halloween snack toast recipes: Cheezy Pumpkin Apple and Franken-Mash!.. 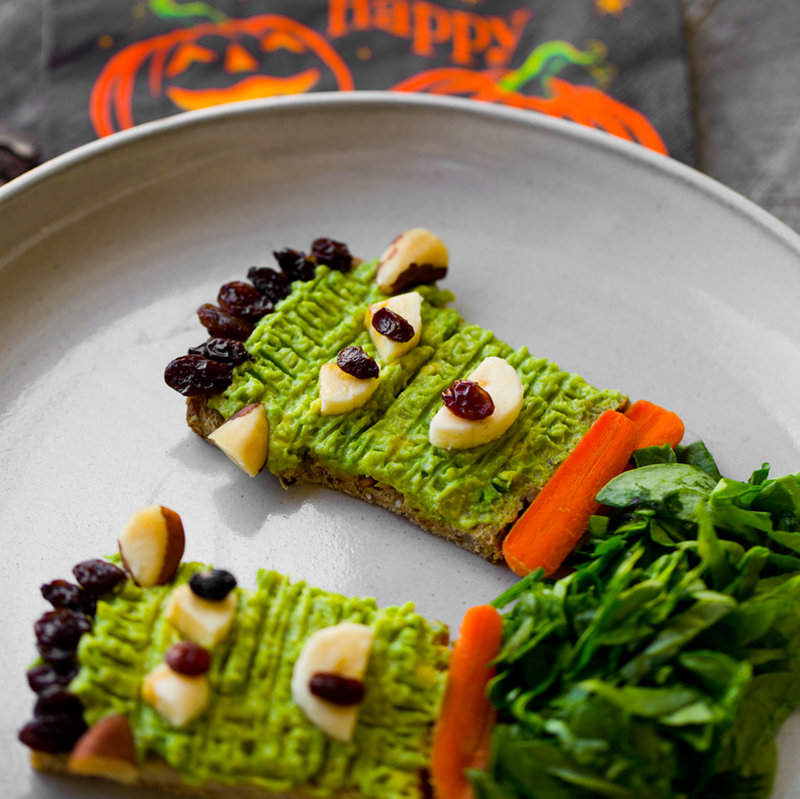 The Healthy Halloween Pinterest Board is LIVE! Explore the board for creative recipes and fall party inspiration, plus enter the contest to win prizes..
Prize: $50 VISA Gift Card up for grabs + a few other goodies. 2. Browse the recipes and get inspired! ps. Keep checking back, I will be adding new recipes to the board every day this week! 3. 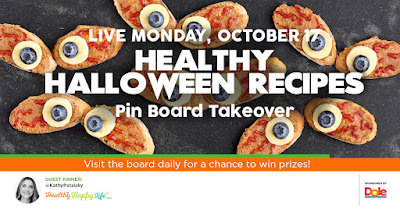 Comment on the special "Prize Pin" - answer this question: What is your favorite healthy halloween recipe? (no link needed, just tell me in words, what it is.) The winner will be notified next Monday - 10/24 - via Pinterest. I hope you enjoy the recipes I am pinning this week! 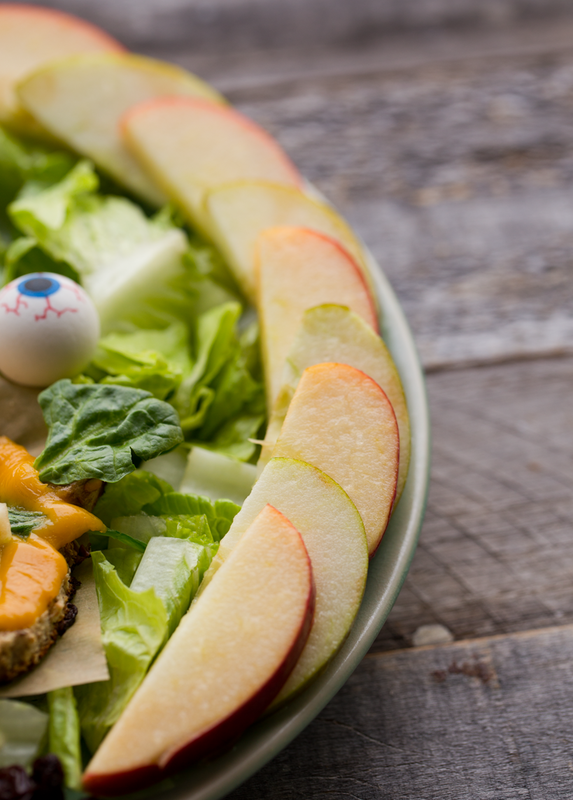 Now for today's spooky recipes.. my Halloween Toast Snack Platters featuring..
To serve, pile on the apples, greens and raisins..
Spooky Franken-Mash Avocado Toasts. 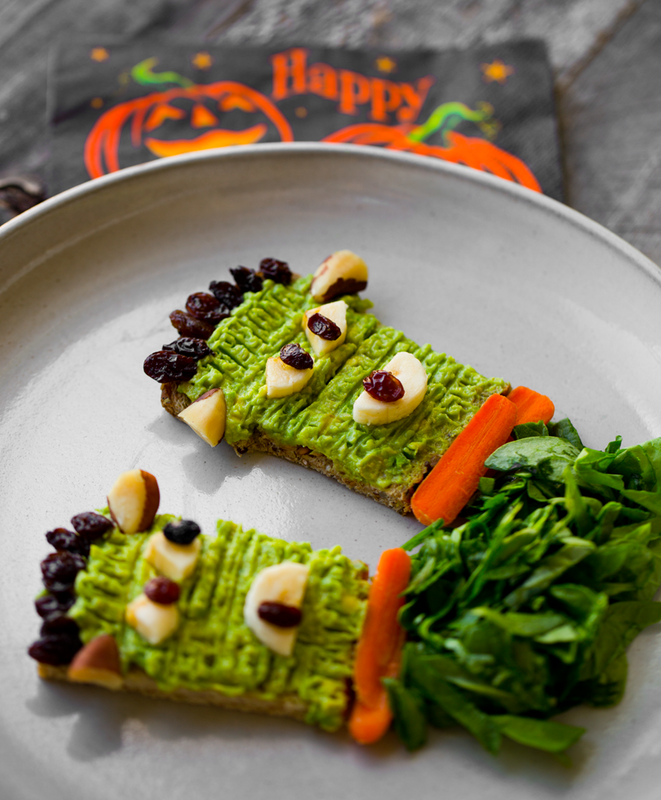 This is a Halloween-spin on one of my fave healthy snacks: avocado toast. 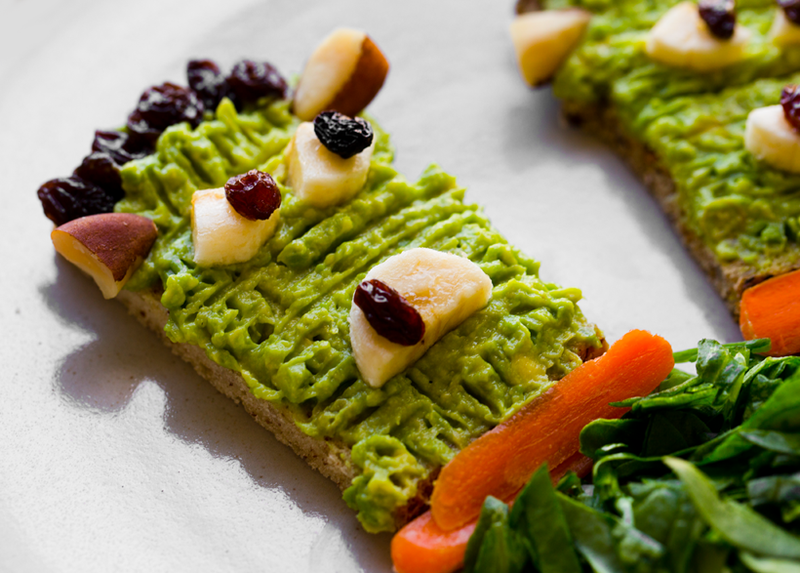 These Franken-mash avocado toasts are accented with DOLE raisins, bananas and organic spinach! These are really fun to decorate to create a silly personality for each toast character. 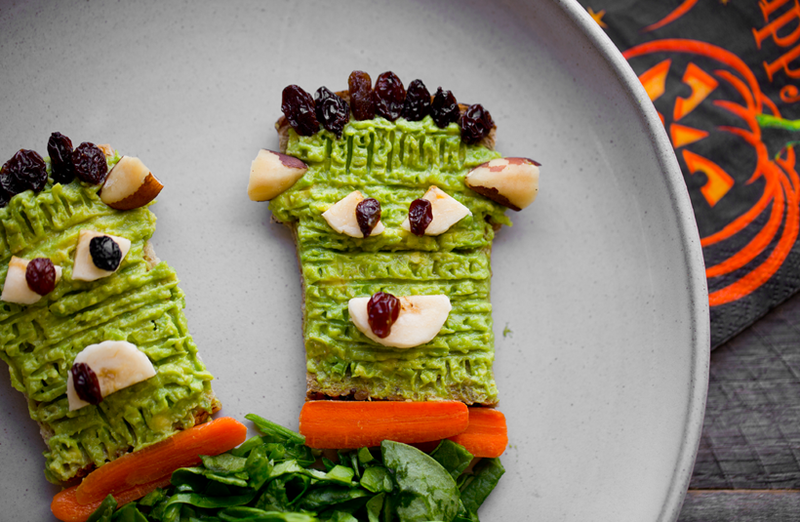 These spooky Frankenstein-inspired toasts have avocado and spinach and a few more healthy goodies to accent! 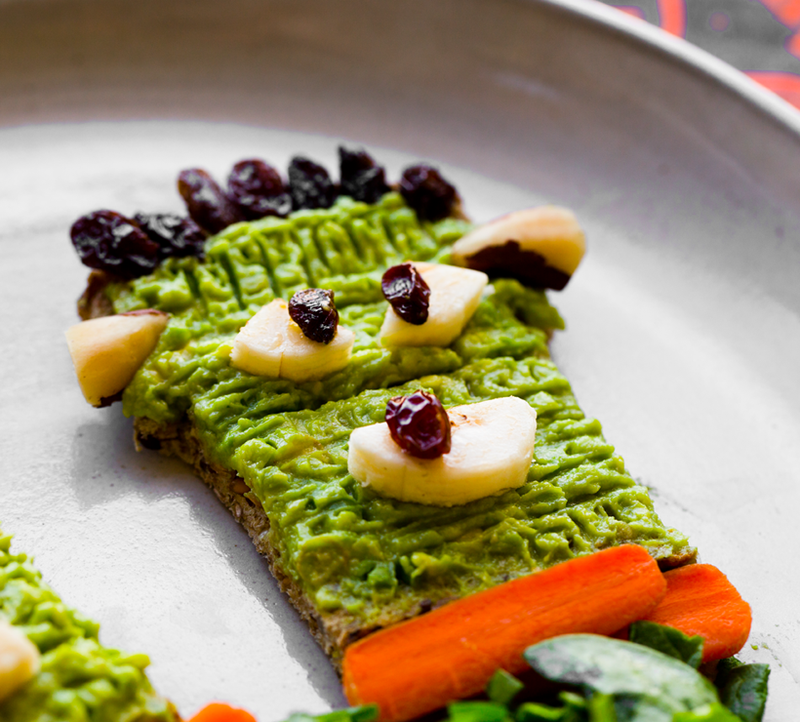 Give your avocado toast a spooky makeover. Remove crusts from bread, creating a rectangle shape. Mash avocado with about 2 Tbsp of lemon juice. Slather mashed avocado of toasts. Using fork, create streaks in the avocado. Add the Brazil nuts to the upper sides of the "head" to create bolts. Then add the raisins along the top to create "hair." Then slice the banana into shapes to create the eyes and mouth. Use the raisins to create eyeballs and any teeth if you'd like. Then add the sliced carrots to create a neck space. Plate the toasts, then add spinach to the plate to create a body. I like to make a "two-headed" look when serving two toasts together. 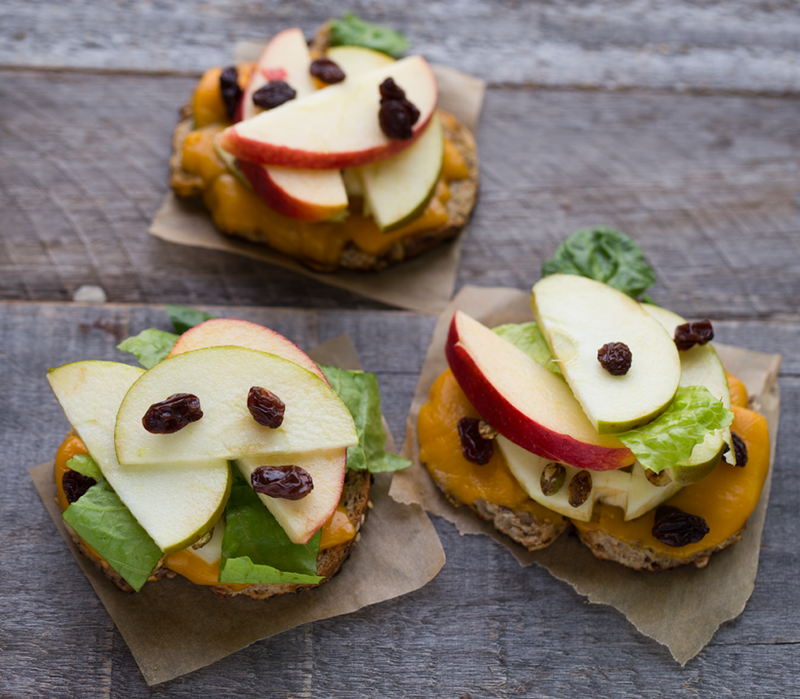 These fun Halloween toasts combine the delicious flavor of vegan cheddar cheese with spinach, romaine lettuce, apples and raisins. Start off by warming up a skillet - one with a lid is helpful for melting the cheese. Using a pumpkin-shaped cookie cutter, cut out the pumpkin shape in your slices of bread. Add a few leaves of spinach to the bread, then completely cover with the vegan cheddar cheese slices. Place the bread on the hot skillet, 1-2 at a time. Add one ice cube to the hot skillet then cover with a lid. Try to place the ice cube on the opposite side of the pan as the bread. The cheese should melt in 1-2 minutes. Remove the toasts from the skillet and repeat with the remaining toast(s). Place toasts aside to cool just a bit. Using a knife, slice the apples so that you create jack-o-lantern faces. Triangles for the eyes, and cut mouths from apple halves. Toss the apple eyes and smiles with a bit of lemon juice to prevent browning. At this time you can also slice up the other apple into thin quarter slices and toss with lemon juice. These will be used on the platter later. 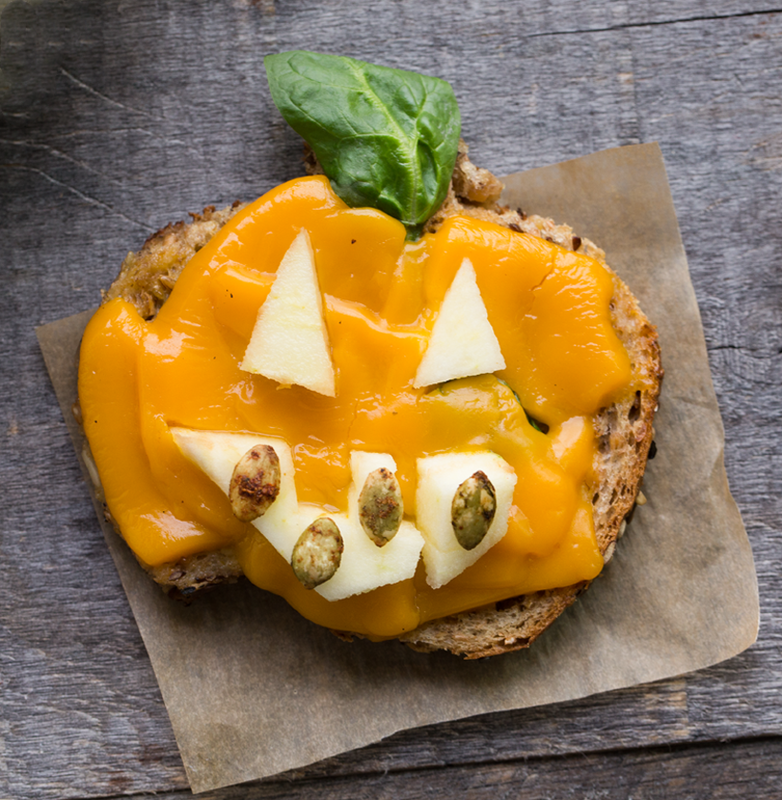 Add the jack-o-lantern eyes and smile to the melted cheese toasts. Add the pumpkin seeds as "teeth." Add a sprig of spinach for the pumpkin stem. To arrange platter: Create a bed of the romaine lettuce, then place the toasts on top. (If you want, you can place the individual toasts on parchment paper for a cleaner presentation.) Then add the apple slices all the way around the top half of the platter. And arrange the raisins around the bottom. Serve!